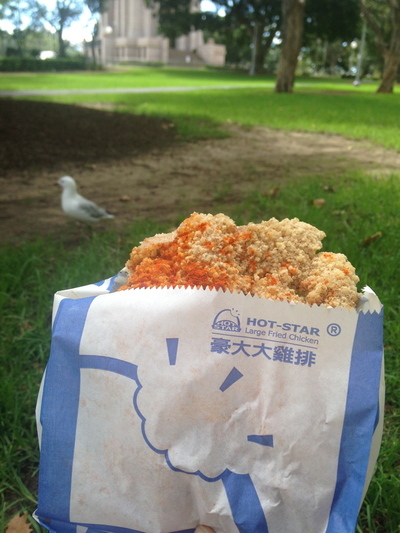 My original chicken piece with little spicy, enjoying at Hyde Park. Have already taken a fair few bites, and yet see how massive this chook is! 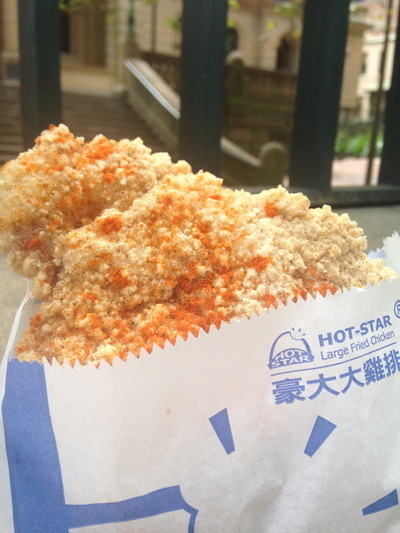 Welcome to Hot Star Large Fried Chicken. 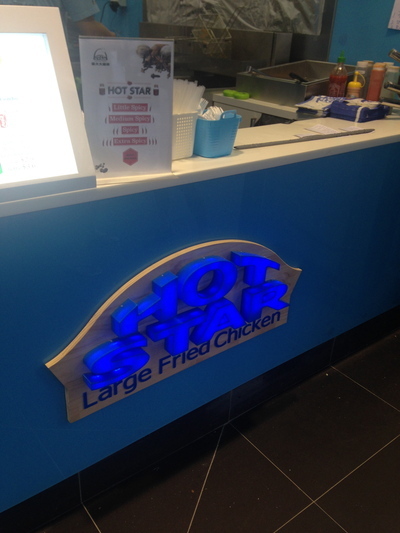 This Taiwanese chicken sensation first opened their doors on Australian shores in Melbourne, and just right on March in 2014 they've now set up shop on Sydney's Liverpool Street, right where the long standing kebab and pizza joint used to reside - right opposite World Square. No doubt, many Sydney siders are already excited about this hot food take away place; especially if you've had a chance to try it further down south in the meantime. Fried chicken, I know...not ideally healthy but hear me out. Although the batter is fried, the texture is ever so light with an abundance of healthy chicken underneath. 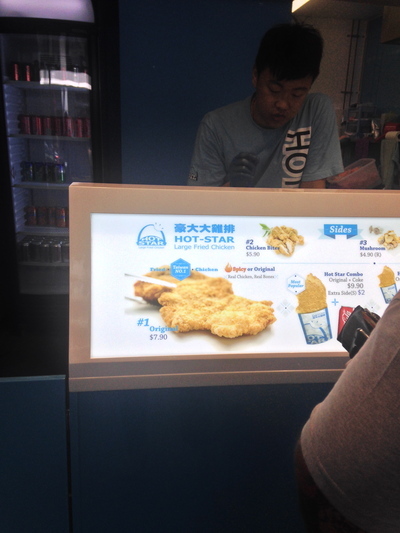 Yum, Taiwanese chicken. Do yourself a favour and score a cheap trip to Taiwan. For only $7.90 (or $9.90 with a 375 ml can of Coke) receive a piece of the largest chicken to be found in Sydney at this time. 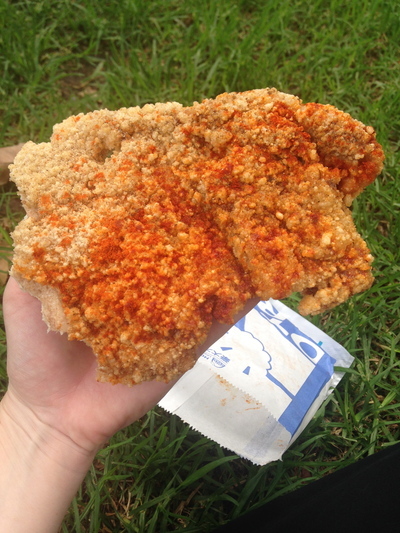 I am not joking, this piece is equivalent to almost two man sized pieces of chicken schnitzel. Real authentic Taiwanese cuisine. The store opens at 11am, and closes at midnight every Sunday to Thursday, and opens from 11am until 2am the next day every Friday and Saturday. On this, I arrived at 11am on a Sunday (right after my yoga class, and my friends warned me to enjoy a light breakfast prior - great advice) to only be in a small queue. I am not joking - the wait times can be excessive for a piece of chook. 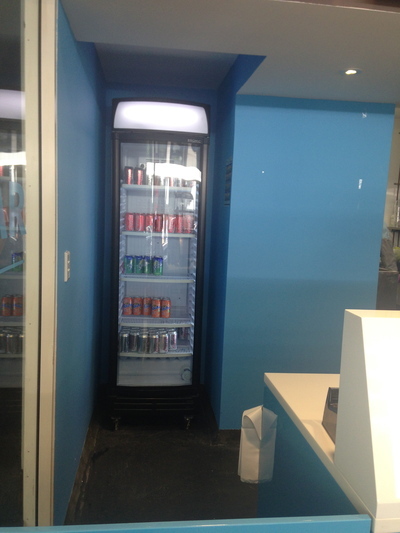 Only drinks available are soft drinks. Need some water too...please. If you're after McDonald's style service, you won't find it here. 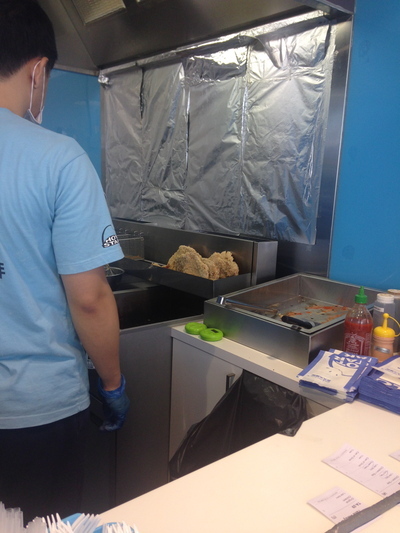 The staff are ever so careful and attentive with the chicken, and the curly fries. They're wearing masks, and therefore rest assured hygiene is top notch priority here. The service all round can be slow. You can easily wait (depending on what time you come here) up to 20 minutes to be served your chicken, and/or other food delicacies. Yet, the wait is worth it. As far as I am concerned, the Colonel can go and take a hike. I am a convert. Recently opened, where that old pizza and kebab joint was. This is a simple take away joint with potential, and what appears to be popularity. They're also giving Subway next door a good run for their money. So full at the end, and it was great to sit down; take a break and enjoy at Sydney's Hyde Park. Do not expect McDonald's like service here, nor KFC for that matter. The chicken is cooked within an eyes view, and size does matter. All of the foods are cooked with love, and strong attention to detail is paid. Drinks wise, they only have soft drink. Pity you can't buy a water bottle here. With the spice factor, you'll want some. There are four different spice levels to choose from: little spicy; medium spicy; spicy and extra spicy. Many of you know that my taste buds can tolerate a lot of spice, yet on this occasion I went for the original chicken piece ($7.90) with little spice. The staff clarified with me a few times that it was little spice that I wanted in terms of the level of spiciness. Great attention to detail was paid. The menu, including that amazing chicken. Well, about 15 minutes after I first queued up, my chicken was ready. At the time of ordering, I was given a receipt with my order number of which was called out when my chicken was ready, together with a plastic bag to carry the chicken in. 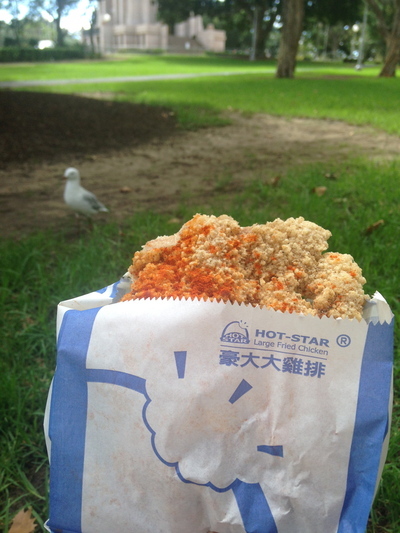 There was no need to put the chicken in the plastic bag as I started to take my first few bites upon walking to Hyde Park, and I ate it there in the grassed area. Got given a plastic bag to put my chicken in. Did not need to use it. Image taken just after I ordered. This was one mammoth piece of chicken. The chicken is nice and white inside, and rather soft - the way quality chicken should be. The batter was light and not greasy. Despite ordering little spicy (the smallest spice factor available) my mouth was burning. It so felt like it was literally on fire. I definitely needed a water bottle, and thankfully I had my own. It would have been good if a smaller piece of chicken was offered with some salad to go with it. I only ate about two thirds of it, and fed the rest of it to the seagull nearby. Despite the intense, spicy flavour - the bird could not stop eating it. Just watch out for a few bones as you head towards the end. Don't be fooled with the spice levels. Whoa! If you love quality chicken, or you're more in the mood for a carnivorous feed; then I highly recommend this establishment. The perfect hangover food. 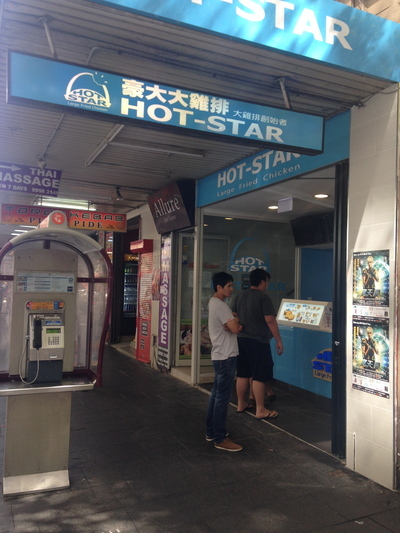 Where: 96 Liverpool Street Sydney NSW. 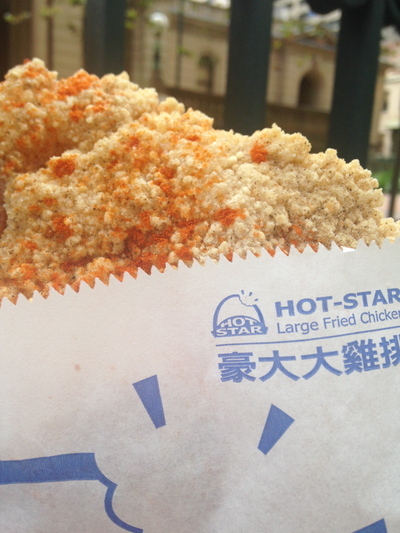 Why: The original Taiwanese chicken. Curly fries and fried mushrooms are also popular here too. 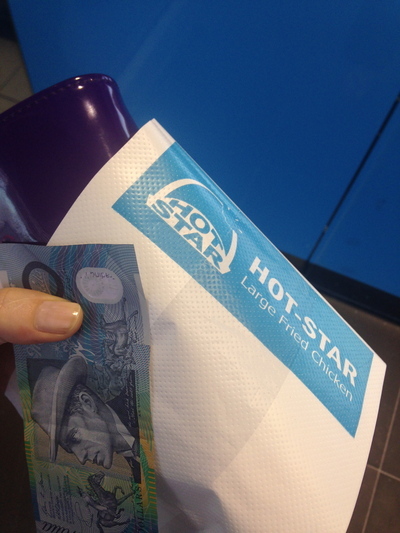 Cost: One large chicken schnitzel inspired piece in a paper comes comes to $7.90. When: Good for lunch, but I think it is better to consume post drinks on a late night. Good for kids: No way. The spiciness is something, and the portion sizes are massive for an adult, and the most patient souls will have their patience tested here. Take away: The only option. On Liverpool Street, not far from George Street. That fried chicken looks amazing! 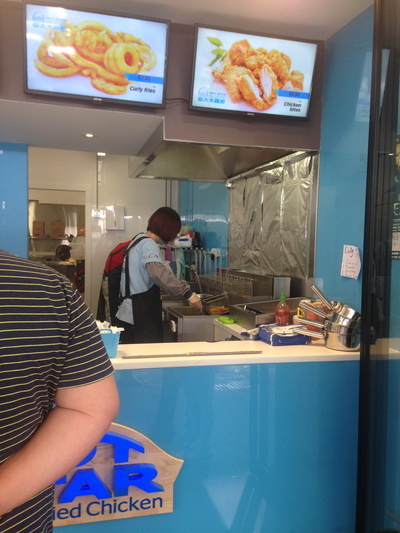 I've tried Korean fried chicken but will have to give Taiwanese fried chicken a go. Thanks Katherine, yes it was amazing. You love spicy food, and despite being fried it is quite gentle on the tum too!